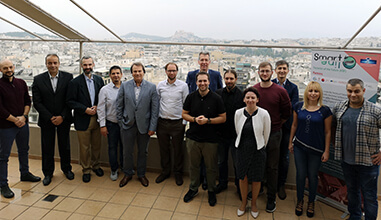 SmartLine's 12th month Consortium Meeting took place at Divani Caravel Hotel, in Athens, on October 23rd, with participation of AUTh, CRF, LayTec, Aixtron, IBS, Suragus and OET. If you want more information, fill in this form. We will get back to you soon. This website is operated by LTFN web administration group, which belongs to the Nanotechnology Lab LTFN, in Aristotle University of Thessaloniki-Greece. When we say ‘we’, ‘us’ or ‘LTFN’ it is because that is who we are and we own and run the website. We collect information from you when you contact us via form, as appropriate. You do not have to give us any personal information in order to use the website. However, if you wish to take advantage of some personalized services we offer, you will need to provide us with certain information about yourself. For example if you wish to contact us or send us a request, we will collect some or all of the following personal data from you: name, email, affiliation you belong/work etc. We require this information to understand your needs and provide you with a better service, and in particular for the following reasons: internal record keeping, to improve our services, send promotional emails about news for LTFN’s activities or to manage your contact request. All the data is stored in the hosting service’s infrastructure and can be accessed by LTFN’s administration group or the hosting service’s administration. Like many other Web sites, http://www.ltfn.gr/ makes use of log files. These files merely logs visitors to the site - usually a standard procedure for hosting companies and a part of hosting services’ analytics. The information inside the log files includes internet protocol (IP) addresses, browser type, Internet Service Provider (ISP), date/time stamp, referring/exit pages, and possibly the number of clicks. This information is used to analyze trends, administer the site, track user's movement around the site, and gather demographic information. IP addresses, and other such information are not linked to any information that is personally identifiable. We believe it is important to provide added protection for children online. We encourage parents and guardians to spend time online with their children to observe, participate in and/or monitor and guide their online activity. LTFN does not knowingly collect any personally identifiable information from children under the age of 16. If a parent or guardian believes that LTFN has in its database the personally-identifiable information of a child under the age of 16, please contact us immediately (using the contact in the first paragraph) and we will use our best efforts to promptly remove such information from our records. Copyright © 2016-2018 LTFN. All Rights Reserved.